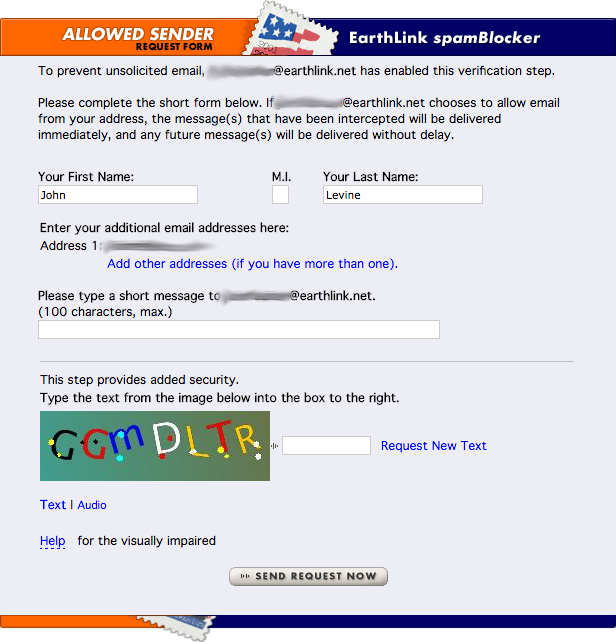 A few days ago I was startled to get an anti-spam challenge from an Earthlink user, to whom I had not written. Challenges are a WKBI (well known bad idea) which I thought had been stamped out, but apparently not. The plan of challenges seems simple enough; they demand that the sender does something to prove he's human that a spammer is unlikely to do. The simplest ones just ask you to respond to the challenge, the worse ones like this one have a variety of complicated hoops they expect you to jump through. What this does, of course, is to outsource the management of your mailbox to people who probably do not share your interests. A friend (really) asked for advice about what to say about mail authorization to people setting up new mail systems, particularly in parts of the world where networks are relatively new and staff less experienced. The first question is are you a phish target? There's two parts to this question. The latest ICANN domain auction brought the auction proceeds piggy bank to about $240 million. The application fees for the new gTLD round were $361 million of which, at the end of March, they'd spent $227 million, and their very conservative estimate is that at the end of the process they'll have spent $289 million. If you add the numbers from the private auctions to the ones for the ICANN auctions, it's as much or more than the application costs. These suggest a much better way to pay for the next round. Domain Name Wire is reporting that the the winning bid in the auction for .WEB was $135,000,000. Assuming they're right (which they probably are,) that brings the total web auction piggy bank to over $230 million, more than twice what it was two days ago. At the Helsinki meeting there was already a lot of interest in the process to decide how the money is distributed, but now there'll be twice as much. This week ICANN will auction off .WEB or .WEBS. There are seven live applications for .WEB and one for .WEBS. There are some deep pocketed bidders in this round including Google, Donuts, web.com which owns Network Solutions and a lot of other web properties, and Schlund which owns the largest web hoster 1&1. Google paid $25 million for .APP and GMO paid $41 million for .SHOP. It's hard to see how .WEB would be worth less than either of those unless bidder fatigue sets in. So stay tuned and we'll shortly know how much more will be added to the $104 million already in the Giant Pile of Auction Money. A guy I know passed along this e-mail sent to one of his customers. They assumed it was a phish, since they didn't recognize the domain name in the link, but couldn't figure out what the goal of the phish was. They even checked the list of ICANN registrars, and nope, registrar.eu wasn't on the list. Nonetheless, this mail was real, and if the recipient had ignored it, his domain would have been suspended. What's going on? information that this e-mail address might not be in use anymore. As we did not receive affirmative response on our last e-mail, we send you a final reminder. provided with each domain registration. One of the oft-made claims about Bitcoin and its blockchain transaction ledger is that they make transactions really cheap, so you can pay someone anywhere in the world for free, or close to it. But when you look closer, is that really true? Not by a long shot. The US government is demanding Apple unlock iPhones in about a dozen cases beside the San Bernardino one. In a strikingly similar case, Judge James Orenstein in Brooklyn rejected the government's request for three separate reasons. In the decision the judge refers several times to the San Bernardino case, and it is clear he expects this decision to be an important precedent for that one. In June 2014 the government arrested Jun Feng in Queens NY on drug charges and confiscated his iPhone 5S. Over a year later, in July 2015 got a warrant to search the phone and found that it was locked. In October they filed a proposed order under the 1789 All Writs Act (AWA) to have Apple unlock the phone. It appears that Apple initially cooperated and suggested some of the language in the proposed order, but if so they changed their minds and opposed it. ICANN has now published the results of the auction for .SHOP, an eye-popping $41,501,000. This pushes the ICANN's auction pot over $100 million. That's a lot of money. There are eighteen more name contention sets that are on hold for various reasons, of which a few such as .WEB look likely to generate even more money once the hold issues are resolved. The Domain Name System is now over 25 years old. Since the publication of RFCs 1034 and 1035 in 1987, there have been over 100 RFC documents published that extend and clarify the original DNS specs. Although the basic design of the DNS hasn't changed, its definition is now extremely complex, enough so that it's a challenging task to tell whether a DNS package correctly implements the specs.